The most popular use of wicker furniture is outdoors. Backyards, patios, poolside are probably where you will find them the most. In these scenarios avoid using natural wicker materials like Bamboo and Rattan. They are more sensitive to weather and prolonged sun or rain exposure can cause cracks or mildew to form. Both of these types are durable. However, for outdoor use, avoid the natural materials and get all-weather wicker materials. 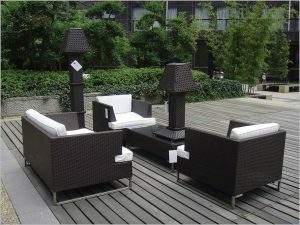 For indoor use like a wicker sofa, Rattan and Bamboo are suitable materials. Note that natural wicker materials require more maintenance than synthetic. Check the weave before any purchase. Avoid deciding based on the aesthetic appeal of the set alone. Check the fibers carefully and ensure that there are no damaged ends. The weave should be done is such a way that it can easily withstand the weight of the person seated. For outdoor use ensure that there are a correct resin and gloss coating. Unless the condition of the used furniture is excellent, always buy new of used. A well maintained new set will last years. While there is no way to tell if a used set has been maintained.